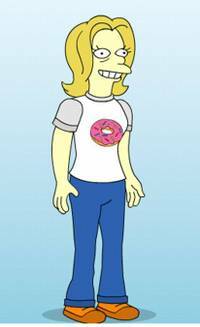 This is me, but on the Simpsons. Notice I'm a little tired. MITCH: So, first there's January and then February. Do you know who's birthday is in February? MITCH: That's right, Frankie's birthday is in February. Next comes March, and Mommy's birthday is in March. FRANKIE: I will make a present for her. MITCH: That's a good idea, what will you make for her? FRANKIE: I will find one for her. One that is for dedults (Frankie's word for adults). FRANKIE: I will find her one she'll love. FRANKIE: I will find her a pretty dress.